On Sunday mornings we run a children’s group (4 – 10 years), a young people’s group (11+) and also provide a crèche for babies and toddlers. More details of Sunday services can be found here. 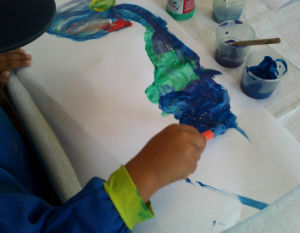 During the week we have a variety of activities for families, children and young people. To get further details on these please use the email address link or the contact form at the bottom of this page. 7 – 8.30pm on Friday evenings in term time. For young people age 11+ (school years 6 and above). Cost £1. Youth Group is an opportunity to have fun together with a range of games and activities and also time to explore the Christian faith. 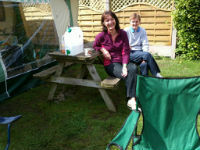 We also go out on fun trips during school holidays and two or three residentials each year. Cliff College Festival at the beginning of May half term is a particular highlight. Sunshine and smiles at Cliff College Festival. Contact Ruth for more information or to book your place. Every Friday from 5.30 - 6.45pm in term time. For kids from Year 1 upward (age 6+), cost £1. Contact Emily for more information or to book your place. It's free to come along and refreshments will be on sale. Contact Ruth for further information. Every Thursday morning during term time from 9.30 – 11.15am. All children under school age are very welcome along with their parents, grandparents or other carer. We have a range of toys and equipment including a designated area for babies. 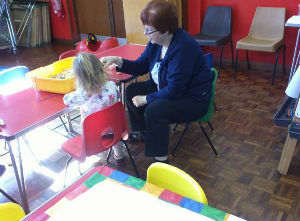 At each session there are several craft activities on offer and usually a sensory play opportunity. Refreshments for adults and children are served at 10.15am and the session concludes with a singing time. Each half term there is an optional Bible Story Time in the church – a Bible story, song, opportunity to pray and a simple craft activity. Special events are held throughout the year e.g. fund raising for Children in Need, decorating the Christmas Tree, Easter Egg Hunt etc. The group is run by a team of friendly members of the church who aim to provide a welcoming, caring and relaxing environment. We have also welcomed students from Rugby College, who have helped out as part of their courses. We ask for a nominal donation of 50p per family. For more information please email Emily. Run from 10am – 12noon on Thursday mornings most school holidays. Children of any age welcome, but under 5's must have an adult carer with them. Cost is £1 for first child and then £2 to cover additional children in the family. The mornings start with a range of craft activities based on a particular Bible story. There is then a time all together to listen to the Bible story, sing a song and to pray. The morning finishes with a light lunch. We run regular residentials and trips for the MIX youth group. Previous trips have included Alton Towers and a day at Greenbelt, as well as a trip to Tamworth Snowdome. 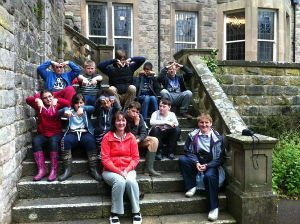 Our most recent residential was to Cliff College.